The last two posts on this here blog have been about Henry Kuttner and C. L. Moore. 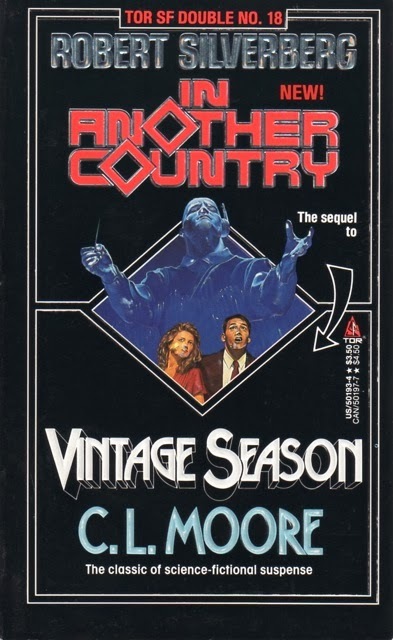 When Jesse of the vast and impressive Speculiction blog pointed out the high marks Moore and Kuttner's novella Vintage Season received from science fiction readers, I decided to give it a read. After a short walk I had my hands on a library copy of the 1973 hardcover edition of The Science Fiction Hall of Fame Volume 2 A. Once I had it I decided to read the Theodore Sturgeon story also found therein, Baby is Three. Originally this story appeared in 1946, as by "Lawrence O'Donnell." Based on my extensive research (10 seconds on wikipedia) it seems likely the story is mostly or entirely by Moore. Oliver Wilson owns a large old house in a large city, and rents the rooms. Abruptly his rooms are in great demand from different groups of very elegant people, people dressed and coiffed exquisitely. They claim to be foreigners, but will not say from what country. Wilson slowly unravels the mystery of where these odd people are from, and what they are doing in his town, and why they are so eager to rent his rooms. This is a very good story, and probably deserves to be in the "Hall of Fame." This is a story about people, and Moore does a good job drawing the characters, making them all believable and interesting, and in exciting in the reader an emotional response to the characters. The characters are actually sophisticated and nuanced, like real people, and as you get to know them better your feelings about them shift, and Moore does this in a way that seems natural, not manipulative. I found the relationships between Wilson and some of the characters very affecting. Moore also does a good job of building suspense; the reader gradually comes to realize something terrible is going to happen, and wonders exactly how horrible the tragedy is going to be, and exactly what the nature of the catastrophe will be. Moore also succeeds in making the end pay off; I found the plot and climax quite satisfying. As the reader quickly guesses, the people who want to rent the rooms are from a future society of great wealth, as evidenced by all the cool gadgets the future people have, and sophistication, suggested by how they, like connoisseurs, appreciate fine foods, fine music, and natural beauty. But there is something a little unsettling about these people, hints that they are connoisseurs not only of beauty, but also of what Edmund Burke might have called "the sublime." For example, they sometimes eat "candies" that are nauseating. In the climax of the story we learn that the future tourists have come to Oliver's town to watch as the town is destroyed by a meteor and thousands of people are killed - Oliver's house provides a perfect view of the cataclysm. Perhaps even more shocking, one of the future tourists is a genius artist who seeks inspiration from witnessing first hand human terror and death on a vast scale. There are lots of interesting things going on in the story. I liked how Moore's clues about the future had nothing to do with weapons, or power sources, or vehicles; instead she describes consumer goods like clothes, food, snacks and stimulants, and even hair products, the stuff of the everyday lives of everyday people, and forms of art and entertainment. I also think the story is about how people from different societies, or different segments of the same society, can be so callous towards each other. The future people have zero sympathy for the people of Oliver's town; even as the holocaust is going on around them they treat it as entertainment, or ignore it to focus on their own lives and relationships. This is reminiscent of how we all respond to hearing about a plane crash or gas explosion or murder in the news; if we don't know any of the people involved, we just go about our lives, or we integrate the disaster into our lives as entertainment and avidly follow the latest developments. Similarly, millions of us find reading books or watching movies or playing games about World War II, or the Napoleonic Wars, or the U. S. Civil War, to be a diverting hobby. I suspect that the reason that Moore points out that there are servants living in the old house with Wilson and the future people, and then almost never mentions them, is to subtly remind us how easy it is for people to simply forget about people who are physically, temporally, or even socially distant. A great piece of work, I strongly recommend Vintage Season. I've really enjoyed some of Sturgeon's work, like "Microcosmic God" and "The Other Celia," but found some of his other things just average, or actively irritating. It is probably fair to say that I like Sturgeon less than most people who pay attention to "classic" SF. In my mind, the typical Sturgeon story is a sort of hortatory polemic in which Sturgeon takes the role of apostle for greater brotherly love and human compassion and/or condemner of our individualistic society; I don't find that sort of thing very compelling. Baby is Three is the first person narrative of Gerry, a boy who goes to see a psychoanalyst. The story is 50 pages long, and much time is taken up with the conversations between the therapist and Gerry. Sturgeon (apparently) takes psychoanalysis seriously, and there’s lots of stuff, like repressed memories, false memories, and hypnosis, that we’ve seen before, though maybe this material was fresh in 1952. Gerry relates his strange life story. After living on the streets he became part of a family of kids with psychic powers. There’s the twin black girls who can teleport. There’s Janie, the little girl who has the kind of telekinesis that lets you make stuff disappear; she can clean the house by making the dust vanish, and can take the turds right out of your intestines so you don’t have to waste time going to the toilet. Then there is the baby, who benevolently rules the family from its basinet by communicating with Janie via a sort of baby sign language. The baby is an advocate for “bleshing,” which means everybody working together, the family being like a human body, with different people each being an essential part of the unified whole. The family survives by using their psychic powers to steal what they want from stores. These kids live in a shack in the woods for three years and then move into the house of a wealthy spinster. The kids teach the spinster the folly of racism, and, when the spinster tries to send the baby to an institution because it appears to be unwell (it never grows) the kids physically assault her with their psychic powers until she reunites the baby with the other kids. The climax of the story is when Gerry has a “breakthrough” during analysis and realizes that he and the kids represent the next stage of human evolution, that they are a single corporate entity. Gerry is the “head” (the baby is just a “computer” and was in charge temporarily while Gerry matured) the twins are the “hands,” and so forth. Gerry has the power to manipulate people’s minds, and makes the psychoanalyst forget all about him. Even though the kids are generally presented in a positive light, there is the hint that the kids and their (presumed) comrades around the world are going to take over and the rest of us may suffer. Sturgeon is a skilled writer (the style and story structure are good) so this story is not painful, but corporate entities, psychoanalysis, and precocious kids aren’t really my thing. I’d grade this one “acceptable” or "marginally good," but it appears that the 1950s and 1960s SF community loved Baby is Three. It was expanded into the novel More Than Human, which Joachim Boaz (and the rest of the galaxy, if Wikipedia is any guide) considers a masterpiece, but which I feel no need to read. 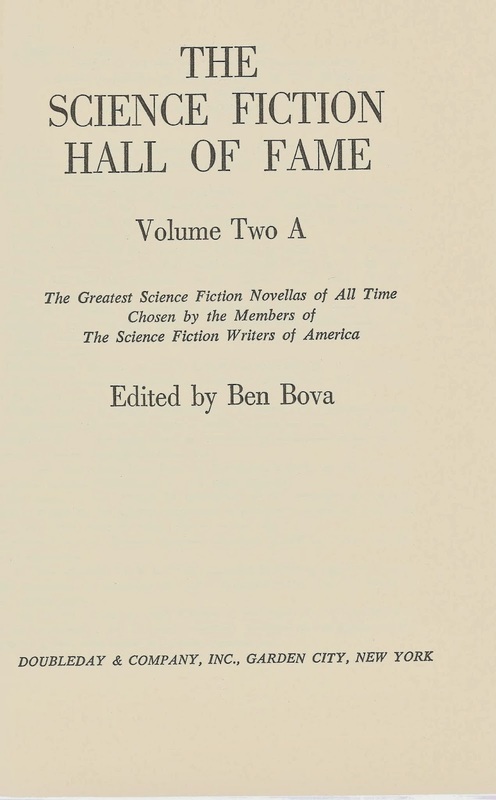 Now that I've got The Science Fiction Hall of Fame Volume 2 A in my custody I will probably read some more of the stories in it. I should probably be familiar with all these SFWA-approved pieces if I'm going to be shooting my mouth off about classic SF. So indeed Vintage Season is worth it. Good to know. Yeah, Vintage Season is really good. The point you make about the impracticality of Sturgeon's ideas is interesting; maybe we should see Sturgeon's work as a wish fulfillment fantasy, like the work of Edgar Rice Burroughs. If you are unhappy because of a lack of freedom, a lack of control over your own destiny, a lack of excitement, Tarzan stories can fulfill that need. If your problem in life is loneliness, a lack of connection to other people, maybe Sturgeon's stories of collective consciousness and corporate entities can fulfill that need. If I can find a copy of Godbody I want it to be the next Sturgeon I read. I read it when it was new, when I was a teenager, and my memories of it are hazy and strange. Right now I am rereading Brian Aldiss's Malacia Tapestry another book I read as a teen, and I am enjoying it, partly because it is good, partly because of the sensation of suddenly encountering a passage that I recognize after decades, but haven't thought about in ages. I'm glad you like the blog! I like your comments, so no need to apologize for ranting!